Two cool factoids about the producer of tonight’s daily Advent whisky: (1) it is the first new distillery on the isle of Islay in 120 years, having opened its doors in 2005, and (2) it is a farm distillery, meaning that it actually grows and harvests some of the barley that it then malts, ferments, distills and matures into scotch. Very cool on both fronts, and hopefully the start of a trend of some newer names in Scotland’s whisky field (ideally not starting with “Glen”). 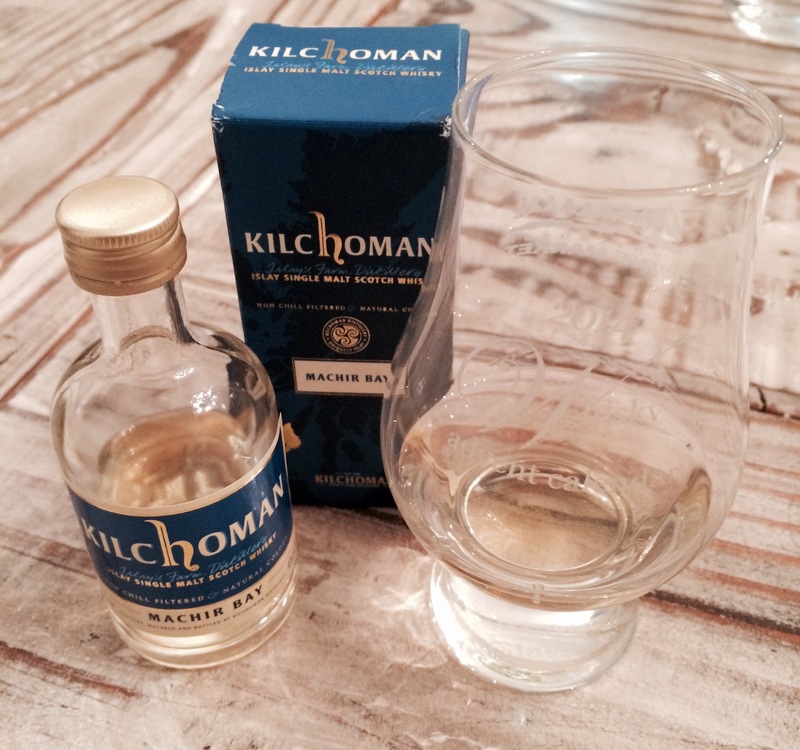 The distillery in question is Kilchoman, and the feature whisky is their workhorse label Machir Bay, a blend that is bottled once per year using the distillery’s own whisky reserves, such that the components of the blend get older with time as the distillery does. Machir Bay used to be a blend of 3 and 5 year scotches, but it’s now up to 5 and 6 years. Interestingly, despite being a mixture of different whiskies, this bottle can still be called a “single malt”, as the “single” in this designation refers to the fact that all of the whisky comes from a single distillery as opposed to a single batch or year. By FAR the hardest bottle to get out of the calendar yet. Damn box. The Machir Bay was initially matured in first-fill bourbon barrels, but then transferred to my most dreaded of aging vessels, Oloroso sherry casks, for finishing — that makes at least 8 out of 15 whiskies in this calendar so far that have had the Oloroso treatment. This one is by far the weirdest. A fairly muted nose is all peat-induced grime, a combination of oil, shoe polish, iodine and leather, as well as a sickly ashy note that the distillery’s own tasting notes proudly describe as “filled ashtrays”. Seriously. Then the wheels totally come off on the palate: after mulling over what the pungent, funky, slightly sour, slightly dirty flavour swirling around in my mouth was, I first wrote “blue cheese”, followed by “feet”. Those enticing notes are rounded off by chemical, coconut water, muddy boots and plenty of smoke, but little by way of pleasure or enjoyment. The previous two Islay scotches in this calendar were phenomenal, but even at a solid retail price of $76, I’m still going nowhere near this one again. This week can only go up!